KRISI, Girl Pow-R’s debut single, was launched today to help empower young people and inspire their strength during times of challenge and adversity, such as bullying. Be powerful. Be real. Because life can be tough, Girl Pow-R is out to inspire others and to change the world! Girl Pow-R announced today the launch of their debut single KRISI to cap off an important week in Ontario where schools held various outreach programs for Ontario’s Bullying Awareness and Prevention Week (November 19 to 25, 2017). In fact, some members of Girl Pow-R spoke at an anti-bullying forum at Cardinal Ambrozic Catholic High School in Brampton on Monday, November 20th. Empowering girls, boys and adults to be ‘ok’ with being different, to reach out and help others, and to be confident, with a new voice and a new sound, is the goal of Girl Pow-R. Life for people all around the world can be filled with trouble and turmoil. But, in most cases, life changes even more dramatically in school as we move from childhood into adulthood. There are unexpected challenges and problems such as bullying. This can be accompanied by fear and distress which can paralyze individuals and effect their health and well-being. This original, pop rock song KRISI talks about the typical mean girl who is full of pride, but deep down she’s scared inside — Krisi is empty. These struggles have also inspired each girl in Girl Pow-R to actively participate in a social cause. In addition to a passion for music, each member of the group also has a social cause that they work on, like advocating for better education for girls all around the world, youth homelessness, or all of us taking better care of our health through the foods that we eat. You can hear about some of their passions in the attached video where Girl Pow-R talks about being stronger, and their goals to help inspire others, at a Youth Day Global 2017 interview with Mark S. Schwartz at Yonge-Dundas Square on Sunday, July 23, 2017. KRISI was written and produced specifically to be modern music, but with a rock edge. Girl Pow-R wants to show its confidence and to help others regain their power – and rock definitely portrays that vibe. The rock edginess of this song speaks to that power. Girl Pow-R is an all-girl, pop rock group ages 10 to 16. This group of very talented young girls write music, sing, dance, and play instruments; they are truly an example of a modern, talented band. Girl Pow-R’s sound is rooted in pop rock, with the goal of inspiring others to be their best, through their music and lyrics. Since May, the group has performed over 55 shows from festivals to Canada’s Wonderland to performances at The Mod Club in Toronto. KRISI also garnered a 2017 Toronto Independent Music Award Nomination for Girl Pow-R and in August they won First Place at a Family Channel competition at Mel Lastman Square. Too often, young people are influenced by the thoughts and life experiences of singers and musicians who are in their late teens and their 20’s. It’s time to give young people an alternative to these messages. The girls hope that their audiences will embrace the changes needed to help improve the world and inspire others, and make the world a better place through the messages delivered in the Girl Pow-R songs. Be powerful. Be real. That is the mantra of Girl Pow-R. In the end, because life can be tough, Girl Pow-R is out to inspire others and to change the world! Become a part of the POW-R WORLD. 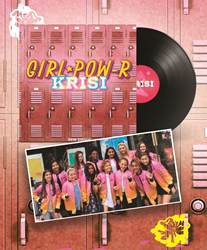 Join Girl Pow-R by listening to KRISI and sharing the song with all of your friends today. You can learn more at the Girl Pow-R website: http://www.girl-pow-r.com, buy a tour t-shirt and find out everywhere that you can listen to KRISI!